Words Of Wisdom For The Graduating Class Of Moore, Okla. High school seniors in Moore, Okla., will hold commencement ceremonies Saturday, despite the death and destruction wreaked by this week's tornado. Scott Simon asks two Oklahoma writers to offer advice to the graduating classes. Words Of Wisdom For The Graduating Class Of Moore, Okla.
With a city still in shambles from a deadly tornado, high school students in Moore, Okla., are graduating Saturday. High school students in Moore, Okla., will graduate on schedule Saturday, 6 p.m. at the convention center. Even more than usual, high school graduates in Moore may feel that this is a week in which they have, as the phrase from Corinthians says it, "put away childish things." 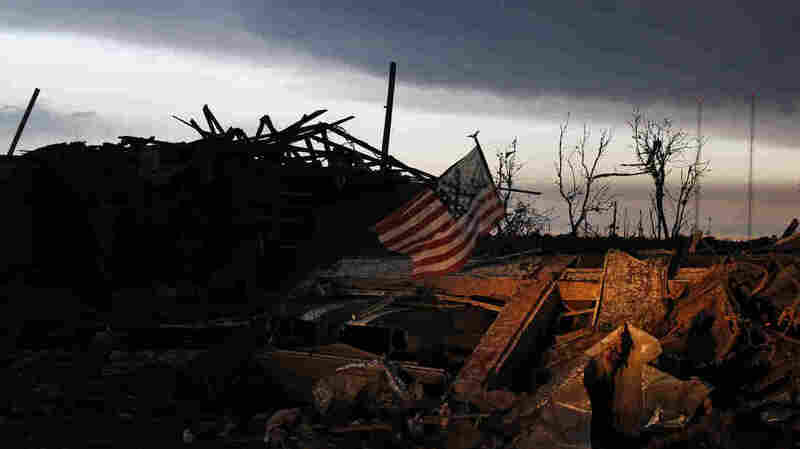 A tornado struck their town and left much of it in ruins. "Just sticks and bricks, basically," said Oklahoma Gov. Mary Fallin. Twenty-four people — family, friends, neighbors, people they grew up with — were killed. The students have seen life, death and loss swirl around them. We asked some noted Oklahoma writers what they might say to local high school graduates today. Michael Wallis, a historian and biographer of the American West, calls Oklahoma "the progeny of an oil-field whore wed to a deacon ... a stampede, a pie supper, a revival. It is a wildcat gusher coming in. It is a million-dollar deal cemented with a handshake." This week he told us, "Storms are a way of life in Oklahoma. We see them wreaking havoc, but also inspiring us, teaching us that out of adversity can come some good. "It's our little bit of martyrdom, maybe. We know we live squarely in Tornado Alley, and we deal with it because it's part of our sense of place." He said many youngsters who graduate in Moore today will one day tell grandchildren how they once heard a tornado, loud as a hundred freight trains, and held on tightly to a sibling, a friend or a stranger and looked at each other in the eyes until they knew they had come out alive. "Now is the time to cry, weep and recall your lost pals, or family, or a pet, or other loved ones," said Wallis. "But it's also a time to just be glad you're here." Rilla Askew, whose most recent novel is Kind Of Kin, told us she'd tell today's graduates that "it's hard to have to learn so young that terrible things happen in the world, and no human power could have prevented it. "But along with sorrow and loss comes a sense of our own endurance. ... You've seen firsthand how many people are good at heart, and that's an understanding that will give shape to the rest of your lives. "Oklahoma's state motto is Labor Omnia Vincit: Labor conquers all. And work we will." Askew continues: "The task is not just the hard physical labor of rebuilding, but also the work of the soul to hold on to what the forces of destruction have shown us about ourselves, about the essential decency of human beings, about the need for community. This is part of our challenge: to work hard, to never give up and to own, deeply, without cynicism or sentiment, who we are."